Unknown, un-registered. (See notes below). Mihaly Ferenczi. Photo Malcom Riketts. 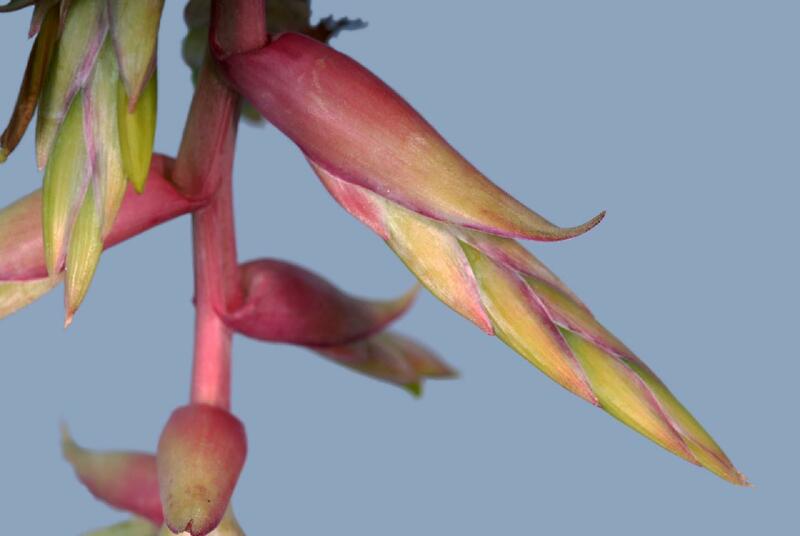 "A few years ago I bought this plant with the label "Tillandsia Alfredo Lau". It is probably from Mexico, but I am not sure. Could someone please help me to identify it. Great looking plant, as we saw at Burwood! Has a T hromadnikiana/prodigiosa look, but I'm favouring the prodigiosa side- small form?? What else looks like this? Pendant hintoniana, other species? What do others think? I've got T hromadnikiana from Europe blooming so I'll post a pic in a month or so to compare, though it already looks different in the foliage and the long, narrow p/bracts. 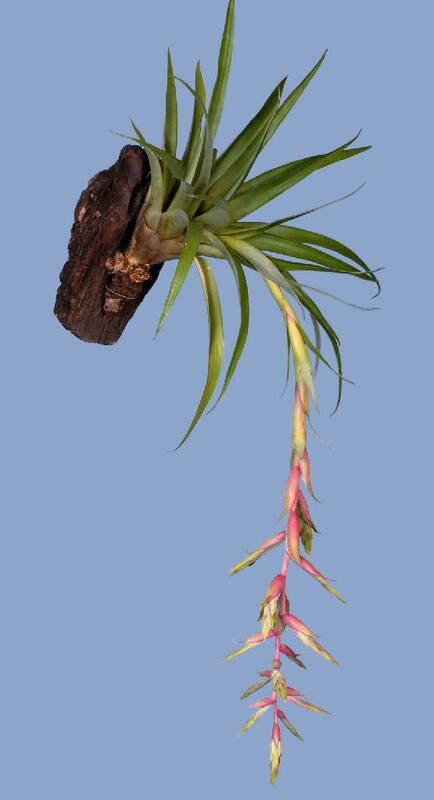 Have you tried the Tillandsia key in the DVD. There are not many with green petals and stamens exserted! It is good fun searching. 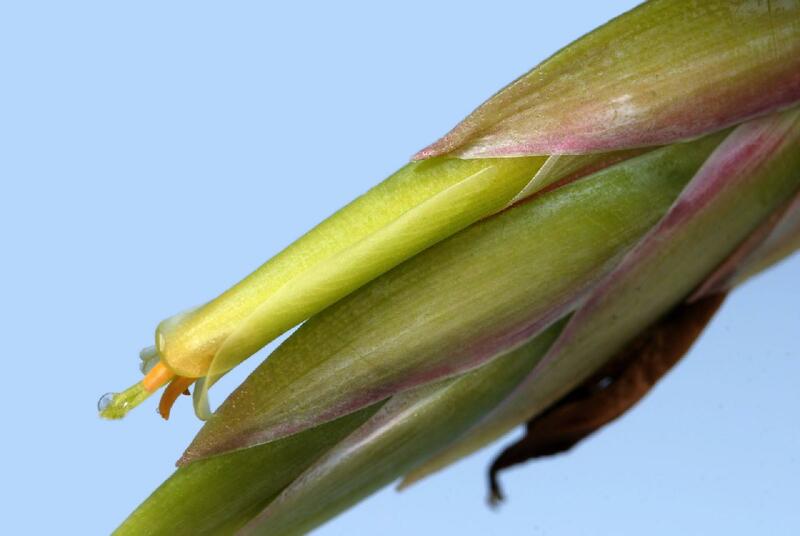 I seem to remember that there was some talk a few years back (first conference in Adelaide when Renate was in attendance) that T. Alfredo Lau may be a hybrid between T. erubescens and T. violacea, does anyone else remember this? Or is it just my aging mind playing tricks on me. This wasn't your imagination. Renate did make that statement. It is caught on the video tape of the Adelaide conference, which I had a chance to see recently - the section where I parroted what Renate had just told me, contained this and a heap of other stuff - though the delivery was unsure, to say the least. Peter just threw in T. supermexicana var pendula into the mix - in addition to those he mentioned earlier. One of the photos on the disc looks similar. You might have to key it. My immediate thoughts were T. hromadnikeana, but on looking at photos, I'm not so sure which I think is closest.